Following the condemnation of British ambassadors for promoting gay rights in eastern European countries such as Poland and Bulgaria, openly gay culture secretary Ben Bradshaw has suggested those in Arabic and Asian countries should follow suit, PinkNews.co.uk can exclusively report. Speaking at Village Drinks event last night, the culture, media and sport secretary praised the work of the Foreign Office in encouraging European ambassadors to fly rainbow flags from embassies and join Pride marches. 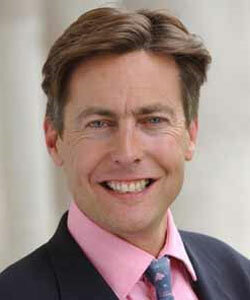 Bradshaw, a former BBC journalist turned politician, also recalled the fight to win his Exeter seat against homophobic doctor Adrian Rogers. He said: “I think the 1997 election was a real turning point for our community and I think it is worth remembering that 12 years ago we weren’t allowed to serve in the military, we weren’t allow to register our civil partnerships, we weren’t allowed to adopt children, we didn’t have an equal age of consent, section 28, all of that stuff. To be perfectly honest, I didn’t really have the expectation that we would deal with as we did so thanks to fantastic campaigning by organisations like Stonewall, pressure from all sorts of quarters. Referring to the row between Labour and the Tories last month, which he started by claiming there was “a deep strain of homophobia” on the Tory benches, Bradshaw said: “I got myself into trouble recently, the last time I addressed an audience of mainly gay people – there may be one or two lesbians hiding in the corner – and I didn’t mean to cause a row when I was asked about this. “I said what I think, which is that I think it’s great we now have sisters in the Tory party to fly the flag. But I judge people by what they do, not what they say. And if you look at the voting records, even the recent voting records since David Cameron took over, they’re not great and I think even gay Tory friends of mine would accept that. Bradshaw also criticised gays in the Tory party for failing to speak out on the new grouping in the European parliament. He said: “What is slightly disappointing is that so far I haven’t heard Alan Duncan or any of the gay Tory MPs on this issue. And the people they’re sitting with from Poland and Latvia have got a very strong record on banning gay rights marches, and the leader of the the party they’re in bed with in Poland described us as faggots. It’s not a great record. And if MEPs themselves are saying, I don’t want to sit with these people, all the gay MPs here need to start speaking out about it. “I want, heaven forbid, if we have a Tory government , for this reform to continue. And applying a little pressure in that direction is not necessarily the wrong thing to do. But I’m sorry if I upset my Tory friends who are here tonight to do that. But I think there still are big challenges ahead. Homophobic bullying in schools is still a major problem and there was a report out last week that [said] homophobic hate crime is on the rise, although part of that is due to an increased willingness to report violent crime which in itself is a good thing. When asked about the importance of representation by PinkNews.co.uk, he said: “I think you can see the evidence of having gay people represented at the top of government in the work that Chris Bryant is doing in the Foreign Office, which I described this evening, and also in the work in in our department. But also the important thing is that you have people who are openly gay represented at the top of politics. It’s fantastic, we’ve never had this before. It means that at long last we’ve reached an age where we have a voice at the top of government. One attendee asked Bradshaw whether the 2012 Olympics could provide a valuable opportunity to promote gay rights.